Left to right: Back Row Andrew Burgess (Nairn), David Sanderson (Nairn), Peter Abbot (vice- president North District), Kyle Godsman (Moray), Andy Burgess (captain. Nairn Golf Club), Richard Gill (Tantallon). 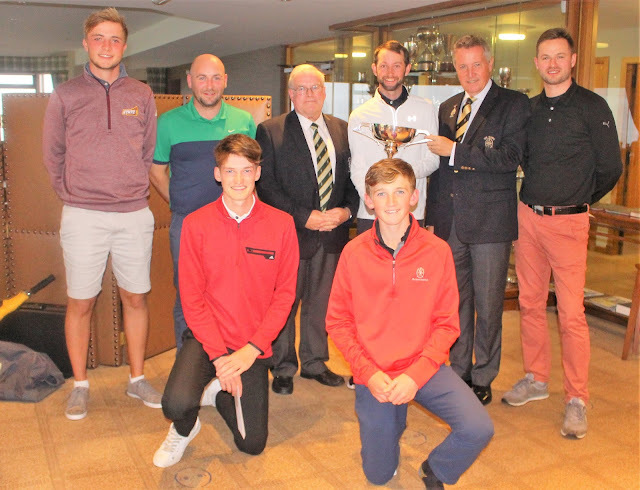 Kneeling: Finlay Asher and Calum Scott, both Nairn Golf Club. 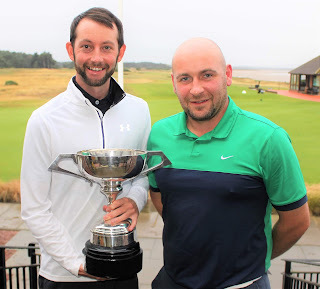 Moray Golf Club member Kyle Godsman won the North of Scotland Open amateur stroke play championship for the David Blair Trophy by six strokes over 72 holes at Nairn Golf Club over the weekend. Hopeman-based Godsman, pictured, virtually won the prestigious tournament with one score - a brilliant second round of eight-under-par 64 on Saturday. That beat Fraser Fotheringham's course record off the blue tees, and lifted Kyle clear of the field. Godsman solidified his pole position with Sunday rounds of 74 and 70 for a five-under final total of 283. Success in the David Blair Trophy tournament was a change of luck for Godsman who had lost TWO play-offs in this event - at Elgin in 2014 and last year at Royal Dornoch. Home course member David Sanderson finished second on 289. He had two double bogeys in his final round of 73 - a 5 at the short fourth and a 7at the par-5 18th. But he did birdie the fifth, seventh, 10th, 12th and 17th in halves of 38 and 35. 292 L Murray (Troon Welbeck) 77 73 74 68. 298 F Asher (Nairn) 77 80 70 71, L Reid (Fortrose and Rosemarkie) 78 74 69 77, A Smith (Edzell) 81 71 76 70, C Gaittens(Fortrose and Rosemarkie) 73 71 76 78. 303 D McIntosh (Bruntsfield Links) 80 77 72 74, C Donaldson (Downfield) 77 79 74 73, D Joel (Inverness) 77 76 72 78, M Rickard (Cupar) 77 73 77 76. 306 S Kennedy (Tain) 73 78 79 76. 308 M Schinkel (Royal Dornoch) 81 76 78 73, L Bryce-Maynard (Moray) 78 76 81 73, B Milne (Banchory) 80 77 78 75. 313 A J Brooks (Kings Acre) 79 73 77 84. R Copland (Cawder) 79 77 81 ret. D Morrison (Meldrum House) 74 81 ret. M Hislop (Glenbervie) 83 76 ret.